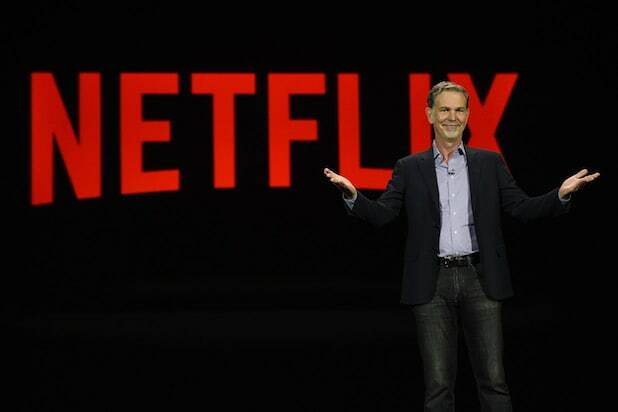 Netflix has never made an acquisition and it’s not going to start with a movie studio like Viacom’s Paramount. But it did endorse Sean Parker’s Screening Room plan to allow new movies to stream at home for $5o on the same day they hit traditional theaters. Speaking during a live video interview to discuss the company’s first-quarter earnings, Netflix executives said the company wasn’t interested in buying a film studio to acquire movie-making know-how in one fell swoop. In February, Viacom CEO Philippe Dauman said the company was aiming to sell a less-than-50-percent stake in Paramount, aiming to finalize a deal by the end of June. It was his first major initiative in the position of chairman. Viacom has battled television troubles as audiences migrate to online video and households scale back pay-TV subscriptions, while Paramount has been hit by two costly flops — “Zoolander 2” and “Whiskey Tango Foxtrot” — this year. But Netflix head of content Ted Sarandos did endorse Screening Room, Sean Parker’s proposed service that would charge $50 a pop to stream new movies at home on the same day they are released in theaters. The service would upend the traditional theatrical business, and sparked an outcry from a litany of big-name directors and other industry insiders. But Netflix is already aiming to do something quite similar to that on its own, by premiering its own original films everywhere in the world at the same time, whether it be online or in theaters. The company pointed out that it would follow that same tack even for its own big-budget blockbuster-style films, such as “Bright” a $90 million Will Smith-Joel Edgerton cop thriller set to be released in summer 2017.